In almost every location and every season, California is a birdwatchers' paradise. One can search Sierra meadows for a Great Gray Owl, the autumn estuary for a Black-bellied Plover, or spring willow thickets for the effervescent song of the Yellow Warbler. Closer to home, backyards, neighborhood parks, and cities abound with many of the state's 600-plus bird species. This beautifully illustrated book, the first based on the relationship between birds and their habitats, is the definitive introduction to California's varied birds and the lives they lead. Introduction to California Birdlife describes the representative birds in California's seven major bioregions: ocean, seashore, coastal ranges, Central Valley, mountains and foothills, Great Basin, and deserts. It explains key relationships among weather patterns, plant communities, and the ecological rhythms of these habitats and shows how these factors relate to the distribution, behavioral adaptations, and environmental challenges of its birds. Jules Evens, principal of Avocet Research Associates, is a field biologist who has specialized in California birds for 25 years. He is author of The Natural History of the Point Reyes Peninsula (revised edition, 1993). 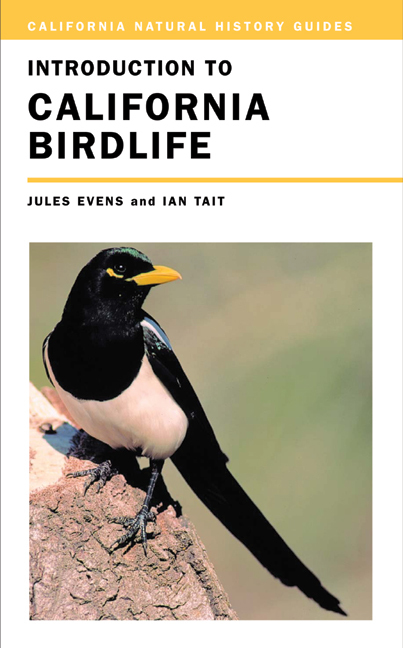 Ian Tait is a wildlife photographer whose work has appeared in scientific and popular journals as well as museum exhibits. He is an Associate of the Royal Photographic Society.